Sport management MBAs are a very tiny fraction of the MBAs earned in the United States and there are relatively few schools that offer them. That’s fitting, because sport management is a field for the elite. In a field this competitive, you’ll need every bit of what you can get out of one of these programs, combined with a strong network and a lot of moxie if you want to get into the top ranks of team or venue management. But just because there aren’t that many schools that offer an MBA with a sport management concentration doesn’t mean it’s going to be easy for you to choose the right one. Instead, it means that each of them have very specific strengths, and the one you decide on is going to have major consequences for your intended career path. It’s not like free throws… you only get one shot here. So we’re going to help you out… put up a little scouting report for you before you make your draft picks. This list of the top accredited sport management MBA concentrations in the country will help you make the big choice. We started out by making sure that all the programs on the list are accredited by a specialty accreditation body. Like the big regional accreditors that handle university-level accreditation, these associations send out examiners to conduct on-site observations, interview faculty and staff members, and go through reams and reams of paperwork. The process is so intense it can take years to complete. What these agencies are looking at, however, is far more specific than just general admissions and academic standards. Instead, they are focusing in on business-related standards. That can include research and teaching processes, faculty qualifications, and curriculum development, among other things. Each aspect of the program is viewed with an eye toward how well it conforms to the current needs of modern businesses and their hiring practices. Accreditation was our first bar, but not the last. The management side of sport management is important: understanding the financial, personnel management, marketing, and other universal components of business is what differentiates you from other agents or executives in the industry. We made sure that we are only recommending programs that have a solid core in the business necessities. But the sports industry is also highly specialized. A concentration has to not only present sports-specific education, but also tie in those basic business concepts to their more extended sporting applications. Sports marketing, for example, is operating in a very different world than conventional marketing campaigns. So we looked for concentrations that offered a bridge between the business essentials and their specific applications in the sporting world. Naturally, we looked for programs that have strong ties to real-world sporting venues or professional teams. Networking is a big element in sport management, and it starts with your internship or capstone project placements. If those are available with major league teams, you’re going to be rubbing shoulders with power players who can help your career enormously. Sports aren’t local anymore, either. We gave a nod to programs that went out of their way to incorporate international studies in their course options, particularly study abroad programs. A few weeks in a futbol stadium or cricket clubhouse seeing how multicultural sporting programs are put together can offer important perspective and terrific networking opportunities. Because you want and need flexibility in your education, we made sure to choose only programs that have at least some courses available online. Sport management is a pretty hands-on business, but learning about it doesn’t have to mean sitting in a classroom somewhere when you can get the same lessons streaming across the internet. All together, we’re confident that what you are seeing in each of the programs that made our list is the future of the sports management business. And that means your future is headed in the right direction. The New Haven sport management program is the oldest business school sport management program in the United States. They’ve learned a few things in all that time, but don’t expect any old-school approaches here: a strong focus on experiential learning that puts you in direct contact with working professionals in the field ensures that you get the latest in trends and techniques as part of your education. The school’s Professional Enrichment Program has brought industry luminaries such as Chris Berman, Bud Selig, and Brian Cashman to campus. You have a wide array of sporting specific business courses to choose from in addition to the core MBA classes; sport business, sports law, sport finances, and additional options in sports analytics and facilities management. The award-winning Career Development Center can help you break in to the notoriously insular sport management world through networking, career assessment, and even salary negotiation services. The faculty for the FAU Sports Management program reads like a Who’s Who of behind-the-scenes sports executives. They have specialized in sports law, security, and athlete management… which means that you have expertise on tap for just about any type of sports management you want to get into. The same solid core curriculum that underlies the standard FAU MBA programs preps you for all the business responsibilities that come along with running a major sports team today. Alongside those, you get special training in sport law, sports marketing, and sports business analysis to give you a serious edge of the amateurs trying to get into the field. Saint Leo University’s MBA in Sport Business is designed specifically for emerging leaders like you who require a robust program that’s also convenient and flexible enough to accommodate your busy, professional life. This comprehensive and rigorous program is designed to address the most relevant issues in finance, marketing, management strategies, ethics, and more while also exploring contemporary topics in sports management. Saint Leo’s MBA in Sport Business is second to none, as it was the first MBA Sport Business program in the nation to be accredited by the Commission on Sport Management Accreditation (COMA). This program features an internationally recognized faculty and an innovative course of study that received recognition by Sport Business International as one of the top online sports management graduate programs. Take up to two classes per eight-week term and you can graduate from this 36-credit program in as little as a year! The Mark H. McCormack Department of Sport Management partners with the Isenberg school on both the MBA Sport Management focus and a full-on joint MS in Sport Management / MBA joint degree, so you know that you are getting a ton of professional expertise in the business of sports no matter which option you choose. You’ll have the option of plowing through sport analytics, consumer sales strategies and market research, and negotiation theory and practice as part of your focused training. Real-world partnerships with organizations like J. League, Asia’s premier professional soccer association, ensure that you gain exposure both to actual industry practices and important international connections. The MBA side of the equation isn’t neglected, either; strategic information management, finance and accounting, and operations and organizational strategy will turn you into a well-rounded business executive who happens to also have killer instincts for sporting industry practices. As the only program of its kind in the United States, the USM MBA with sport security management emphasis offers the opportunity for you to position yourself as a unique asset to sports organizations and venues. In a world where the threat of terrorism or mass shootings has spiked, more and more businesses are looking for individuals with expertise in preparing for and containing such risks. When those skills come with executive-grade managerial and business capabilities, big money is available for the right candidates. This MBA can turn you into one of those candidates with rock solid accounting, finance, and strategy courses followed on with threat and risk assessment and emergency response planning classes coordinated with the National Center for Spectator Sports Safety and Security… a global resource for teams and stadiums planning security protocols. As a graduate student you’ll be heavily involved with real-world threat analysis and applied research projects at the center and receive guidance from industry professionals and experts at national summits. Most American sports management MBA programs relegate their teaching to North American sporting markets and focus on popular sports here. But the Southeast Online program understands it is serving a global audience, and educates students about global opportunities and universal competition in the sports environment, as well as discussing regulatory concerns facing all collegiate and major league sports. The program also encourages interaction with internationally diver customers and suppliers, bringing in an additional global perspective. Seton Hall’s sport management MBA concentration starts off with an emphasis you won’t get in a lot of sports management programs, let alone major league sports in general: ethics-centered education is the core of every course you’ll take at the Stillman School of Business. The respected Micah Center for Business Ethics is devoted to exploring questions of ethical behavior and decision-making. But this focus on understanding what the right thing is and how to do it doesn’t present any obstacle to a state-of-the-art, up-to-date course of training in a frequently cut-throat business. Located on the edge of the sports-heavy New York metro area, you’ll have the opportunity to see how professionals in the industry make their calls. That location also means that many of the faculty and your fellow students will be drawn from major sporting organizations, expanding your network dramatically before you even get out of the program. You may not think of Garden City when you think of the hubs of American sports, but check your eye-rolling… we’re talking about the training camp location of the New York Jets, here. Okay, sure, it’s across town at Hofstra, but Hofstra doesn’t have a sports management concentration for their MBA program, do they? Adelphi, on the other hand, has turned out port like Bob Beamon, Mike Windischmann, and Chris Armas… who later returned to coach women’s soccer right at Adelphi! There is plenty of talent in both business and sports at Adelphi, and as an MBA candidate in the sport management program, you will get all the exposure you need to both areas of expertise. St. Thomas Aquinas University’s MBA in Sport Administration is a fully online program that’s specifically designed for working professionals like you. While you’ll study at a distance, this program is anything but, featuring interactive coursework in case studies, group discussions, and projects—all of which allow you to become part of the learning experience. In addition to a comprehensive MBA core, you’ll dive deep into areas of sport administration such as sports communications and public relations, risk management, governance of intercollegiate sports, and more, along with a sport administration capstone, designed as a seminar/supervised fieldwork experience. In addition to its fully online course of study, you’ll appreciate this university’s impressivestudent-to-faculty ratio of just 18:1, its recognition among U.S. News & World Report’s list of Best Colleges, and its outstanding career development services through the Office of Career Development. As a field dominated by big organizations and big money, it’s easy to forget that most of the participants in professional sports are effectively small-time entrepreneurs: players and their agents are start-up businesses, struggling to make a name for themselves and cut deals in a dog-eat-dog world of heavy competition and relentless performance. So it makes perfect sense to combine entrepreneurial and sports management courses the way you’ll find at Western Carolina. An MBA earned there with a specialization in sports management and entrepreneurship will give you the background in innovation and action you need as a nimble negotiator, while also filling you in on all the sports management philosophy and trends that power a multi-billion dollar industry. Sports is an insular business, so to get ahead, you need not only the fundamentals of business education, but also highly specific industry knowledge and—most importantly—a strong network of contacts already working in the field. The Tiffin sports management MBA concentration gives you all of those elements, helping you launch a career that can mimic the success of previous graduates. Those students have gone on to work at VP positions with the NFL, with the PGA, and pro hockey teams among other major sporting organizations. A core curriculum that is heavy in quantitative analysis and research provides a solid foundation for the business and personnel strategy lessons you’ll learn about the sporting industry. Point Park University’s MBA in Sports, Arts, and Entertainment Management (SAEM) program features 36 credits, manageable eight-week courses, a robust MBA core, and a fully online course of study in contemporary issues in sports management. You’ll study from an esteemed faculty who have extensive experience in the field as sports agents, marketing directors, concert promoters, and more while you explore in-depth topics like SAEM marketing, resource and fiscal management, and the business of live entertainment. You’ll also have outstanding opportunities for experiential learning through internships, co-ops, and similar projects. As an online student, you’ll have access to superb career development services through the university’s Career Development Center. Just a few of the resources available include assistance with creating tailored resumes, conducting successful job interviews, creating career goals, and using technology to research and apply for jobs. 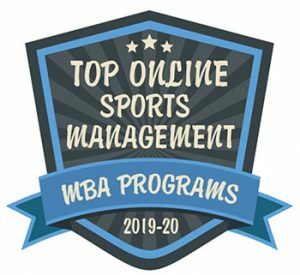 Bryan College’s MBA in Sports Management is a fully online program designed from a Christian standpoint and focused on adult learners like you. Thanks to this program’s accelerated format of nine-week classes, you can complete this 36-credit degree in as little as 18 months—entirely online. In addition to a solid MBA core, the MBA in Sports Management is designed to prepare you with the skills you’ll need to serve as a strategic leader in a variety of sports organizations. Just a few of the areas of study include sports facility and event management, sports marketing, finance, and organizational leadership. Other perks of this program include a fully engaged and dedicated faculty and excellent support services through the Academic Success Center and the Career Services office. APU combines a heavily analytical approach to the basics of business management with the theoretical and practical concepts used by sporting industry professionals in leadership positions. You’ll learn about sports marketing strategies, sport financing theory, and health, fitness, and wellness operations. Public relations is also on the menu, a critical addition in an age where every star running back is only one Tweet away from igniting a scandal on the team’s doorstep. A lot of MBA candidates choose a sports management concentration with dreams of going into the big leagues… getting a job with an NFL, NBA, or MLB team, or working at a major sporting venue or equipment manufacturer. There’s nothing wrong with those dreams and there are a lot of MBA concentrations that aim squarely at that aspect of the sporting business. But the reality is that there are a lot more perfectly lucrative positions working in more humble settings… college football, gyms and clubs, even city recreational departments. The Salem University Sports and Recreation Management concentration acknowledges that reality and prepares students not only for managerial positions at big teams and leagues but at sporting organizations of all levels. Courses in youth development, coaching, and event coordination give you a ground-level view of management, while a look at the economics of sports and recreation ties in the central business knowledge you get with the core MBA program. Thirty-nine credits, 13 courses, full- and part-time options, and a fully online course of study comprise Concordia University Wisconsin’s MBA in Sport and Entertainment Business, which is designed specifically for working professionals like you. This graduate course of study features eight-week classes that include an MBA core, STEM courses, and an in-depth exploration into athletic and entertainment management. Just a few of the reasons this program stands out from its competition include: experiential learning opportunities, an esteemed faculty of experienced practitioners, networking opportunities with experts in professional and amateur sports, and intensive field experiences at major sporting events like the Rose Bowl, the Final Four, and the College World Series. Just a few of the areas of study include public relations and social media strategies, sponsorship and sales strategy, brand activation, and event management. Plus, as a student here, you’ll complete a portfolio that will highlight your work for potential employers.